is a family-owned business located in the ‘Valley of the Sun’ and covering the NORTH, SOUTH, EAST AND WEST VALLEYS and anywhere in the State that people require our services. Keith is a licensed contractor here in Arizona and previously in the State of Colorado. He has vast experience in Construction, Plumbing, Electrical, Management, and Screen and Awning Installation and Training. He is the Qualifying Party for the License and is personally hands-on at almost every jobsite. Ken has been in the awning and screen business, here in ‘The Valley’, for 48 years. Selling, Designing, Training sales people, and Speaking at conferences were all part of his career. Delia has extensive experience in Sales, Marketing and Management. When her Husband, Ken and brother, Keith decided to go into business together she knew she had to become part of the company to ensure things would run properly. 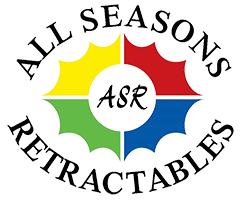 Our goal at ALL SEASONS RETRACTABLES is to put Professionalism and Honesty in the forefront of each and every homeowners mind. The three of us make an educated, caring and trusting Team. We want to be YOUR Team now and for years to come.